With the pixel technology the laser is delivered in columns rather than layers with the columns being referred to ‘pixels’ like in a digital photograph. 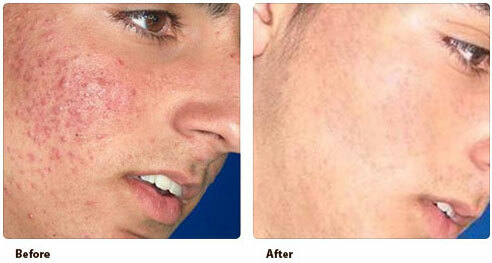 Pixel treatment is based on the principle of micro thermal treatment zones. 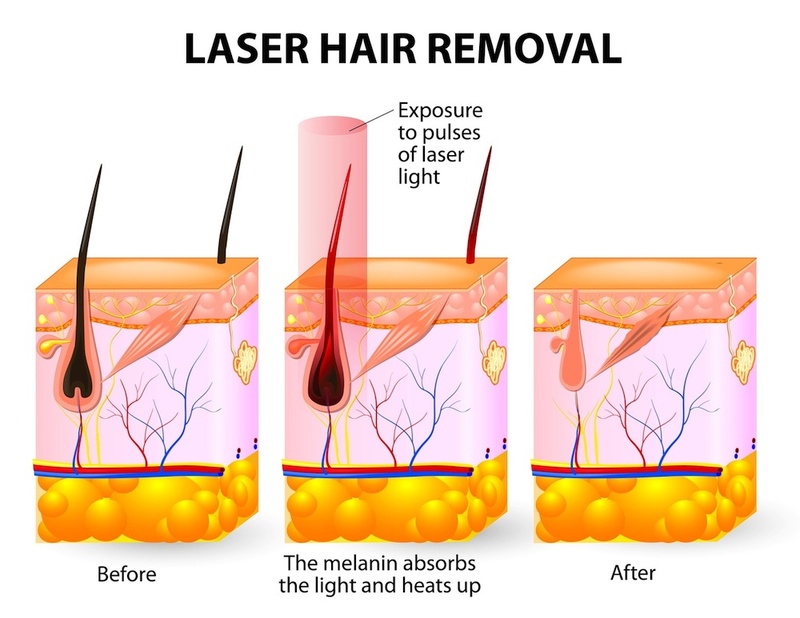 The laser pulse creates uniform tiny ‘pixels’ of treated zones, removing the epidermis and upper dermis, but leaving surrounding tissues untouched and intact. 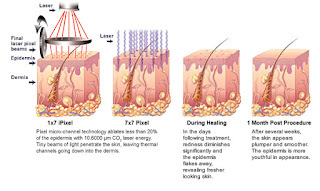 The treated pixels trigger the body’s natural healing process stimulating the growth of new healthy skin tissue and increased collagen formation, with the small bridges of untreated areas acting as a reservoir for more effective and rapid tissue healing and collagen production. The end result is new healthier, smoother tissues in place of skin imperfections. 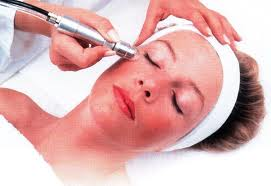 The safety of pixel makes it a suitable laser to treat the eyelid areas as well as the face and the rest of the body. Laser Pixel is one of the revolutionary skin treatments from that offers you the chance to look younger, healthier and let your inner radiance free. 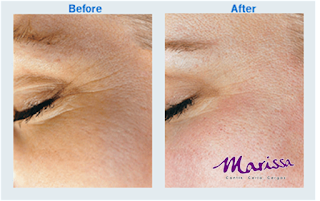 The laser treatment can clear years of sun damage such as age spots, fine lines and wrinkles. Pixel can also shrink the appearance of pores and smooth out acne scars, giving you the soft and flawless skin of years gone by. In other words, Pixel can help transform blotchy, spotted and pockmarked skin into the radiant glow of one’s youth. Pixel skin fractional resurfacing is based on the principle of microthermal treatment zones. 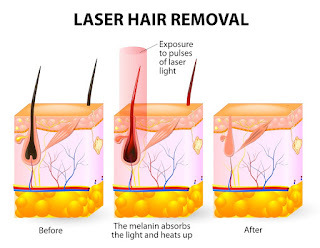 The laser pulses create tiny holes in the skin, removing the epidermis and upper dermis. The treatment then triggers the body’s natural healing process; stimulating the growth of new, healthy skin tissue from the edges of the microscopic hole. 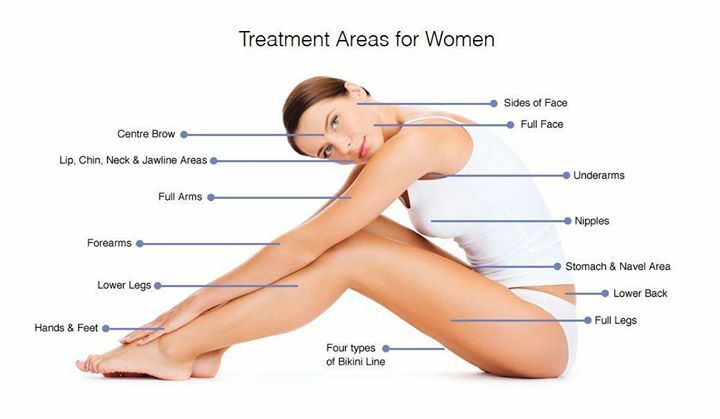 Pixel laser skin resurfacing works with the idea that the body will heal itself with new, smoother healthy skin. 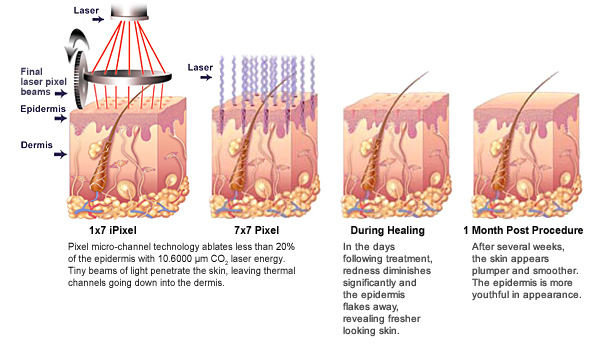 Using the principle of microthermal treatment zones, laser pulses make microscopic holes in the skin’s surface. This action stimulates the body to begin healing the epidermis and upper dermis layers, promoting the growth of new, young skin. The pixel laser procedure addresses small areas of the face at a time with the surrounding skin left undamaged. The untouched healthy skin surrounding the treated area helps promote quick and effective healing and increased collagen production. The result is younger looking skin in place of aged, damaged skin. The more times the treatment is done, the better the results. No special care is necessary before a pixel laser appointment. However, once in the physician’s office, patients are usually given a topical anesthetic to reduce the discomfort of the procedure. The anesthetic takes 30 to 60 minutes to take effect, and the patient face will be cleansed and dried. During the procedure, patients may experience a slight warming sensation similar to sunburn in the area being treated. Because of the nature of the laser, discomfort is minimal and less analgesia is required. After treatment, patients may experience some redness, which fades quickly over the next few days. It is important to take care when cleansing the face while healing, as the skin will be delicate. Avoid using scrubs or harsh ingredients on the skin until all redness is gone. Sun protection is critical after pixel resurfacing. A broad-spectrum sun block of SPF 30 or higher should be worn and reapplied several times throughout the day. Keeping the skin hydrated will aid in healing, so wearing a good moisturizer is also recommended. The treated skin will be fragile for the first 3-4 days. Special care needs to be taken when cleansing the face during this time. Avoid using facial scrubs, washcloths or buff puffs. The treated skin will look better within days following the treatment and results should steadily improve over the next few months. It is imperative to use a broad spectrum SPF 30+ sunscreen every day to prevent further damage. Your consulting nurse can give you advice and start you on a suitable skin care regime for your skin type and requirements. Pixel laser to provide textural and skin tone improvement for their patients. This device creates thousands of tiny perforations in the skin, similar to pore sizes. This procedure is called “fractional laser resurfacing.” The skin around each of these perforations remains intact, and the epidermis rapidly heals from the edge of these tiny holes. (ie: only a “fraction” of the skin is resurfaced each time) The patient who undergoes a Pixel treatment will only be red for one or two days for the procedure. Makeup can be applied immediately, so there is really no downtime, which is very attractive to most patients. Furthermore, hypopigmentation has not been described with this laser. 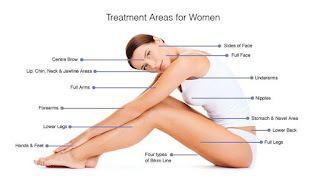 The only “downside” of the procedure is that it must be repeated several times for optimal results because only a portion of the total skin surface is treated each during each pass. The settings of the Pixel laser dictate the down time. The best results with Pixel are achieved with more aggressive settings on the laser and with stacking (repeated pulses of the laser on the same spot). At higher settings, the skin of the face looks and feels rough and also has a bronze appearance for a few days. During that first 3 or 4 days, most people are self conscious about their appearance. After the third or fourth day, the roughness and bronzing begin to resolve and are usually gone after a week. This new old “wonder” supplement is called Glutathione. Glutathione is an amino-acid that has been known to help the body fight free radicals produced from pollutants found in the air, food and water. Today, it is more popularly known and much sought after for its skin lightening benefits. In increased dose, it is said to have a remarkable good ‘side effect’ on the skin. skin whitening and other skin enhancing and nourishing benefits. Dermatologists prescribe it to remove dark spots, prevent or get rid of pimples and pimple marks, take away or prevent wrinkles, and other beauty-related treatments. Its skin whitening regimen is widely used in Asia and has been reported to be the “Asia’s Most Prescribed Oral Skin Whitener” among the skin whitening products. It is often referred to as bleaching pill, bleaching capsule, whitening pill or whitening capsule. Many dermatologists use it. Oral administration of this supplement, taking in consideration the proper dosage, is said to help lighten one’s skin and give it a youthful sheen. How it works as skin whitener The inner layer of the skin called dermis and the outer surface which is visible to our eyes is the epidermis. The primary element that determines the color of human skin is the amount of melanin in the skin. 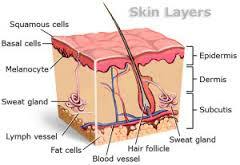 And melanin is produced by a cell called melanocyte. In increased dose, glutathione helps whiten the skin by reducing melanocytes which then leads to reduction of melanin in the skin, making it look fairer. But this is not an overnight fix. It takes a little time to see initial change in one’s skin tone. That’s because glutathione’s whitening process starts from inside the skin (dermal layer) going outward (epidermal layer). Glutathione supplements however, it is very likely that the body will oxidize the Glutathione. “Oxidized Glutathione” reduces the effectiveness Glutathione as an anti-oxidant, anti-aging or a skin whitening agent. This “oxidation process” can be prevented by taking Vitamin C. Not only that, Vitamin C also helps raise the level of Glutathione by helping the body manufacture it. According to recent research, a person taking Glutathione should take two to three times more Vitamin C (ascorbic acid) than the dose of Glutathione. More than just a beauty product The recent popularity of Glutathione as a wonder skin whitener has overshadowed its other health boosting benefits! Unlike any other whitening pills / capsules, glutathione doesn’t just whiten the skin, it is also an anti oxidant and anti-aging pill which is important for overall good health and long life. A closer look at glutathione What exactly is this wonder nutrient? Glutathione is a small protein composed of 3 amino acids called cysteine, glutamic acid and glycine to help the body respond to the environment such as pollution in the air we breath, water we drink, chemicals and pesticides in the food we eat that cause damages in our cells and system. Dubbed as the Master Antioxidant, it regulates the actions of lesser antioxidants such as vitamin C, and vitamin E within the body. It is present mostly in liver where it detoxifies many harmful compounds which are then excreted through the bile, red and white blood cells, lungs and intestinal tract. A major free radical scavenger enzyme, it helps prevent cancer especially liver cancer, essential for the functioning of the immune system, protect individual cell and tissues of arteries, brain, heart, immune cells, and kidneys. Anti-viral too Paul Cheney, M.D., Ph.D. and expert in the treatment of Chronic Fatigue Syndrome says that “Glutathione has potent anti-viral properties – if tissue and serum glutathione levels are significantly increased, the replication of most pathogens are slowed or stopped. Conversely, glutathione deficiency produces a pro-viral effect.” Sources that boost your body’s natural production of Glutathione. Glutathione is manufactured inside our cells. Our cell’s ability to make glutathione is directly determined by the supply of raw materials, in particular, the amino acid cysteine. Cysteine can be found in meat, red peppers, garlic, onions, broccoli, brussel sprouts, oats, milk, whey protein, and wheat germ. However, it can usually be produced by the human body under normal physiological conditions if a sufficient quantity of methionine is available. When your body is deficient in glutathione Without the protection of Glutathione, our cells will die at a faster rate, making us age quicker and putting us at risk for all kinds of toxin-induced diseases. A deficiency of glutathione can cause destruction of red blood cells, leading to anemia and oxidative stress and brain cell death and Parkinson’s Disease. Other health conditions that are associated with glutathione deficiency include diabetes, low sperm counts, liver disease, cataracts, and HIV infection, respiratory distress syndrome, cancer, and idiopathic pulmonary fibrosis. A research study done by Eric Topol, MD and published in the New England Journal of Medicine suggests that abnormally low glutathione levels may increase the risk of heart attack. Bad news for smokers, too, Cigarette smoking helps reduce the level of glutathione in the body. Reduced levels of glutathione increase the risk of health problems and health problems deplete the supply of glutathione in the body. It’s a vicious cycle. Side Effects What about serious side-effects? Studies show that there have been no noted untoward side effects of Glutathione. In fact as we noted earlier, SKIN WHITENING is the “SIDE-EFFECT” of Glutathione! So it is probably safe to add Glutathione to your daily habit of taking supplements. In fact, it’s not only safe, it will make your vitamins and other nutrients work even better because Glutathione is the master oxidant. Overdose? No danger, because, the more you take glutathione, the lighter your skin will appear!